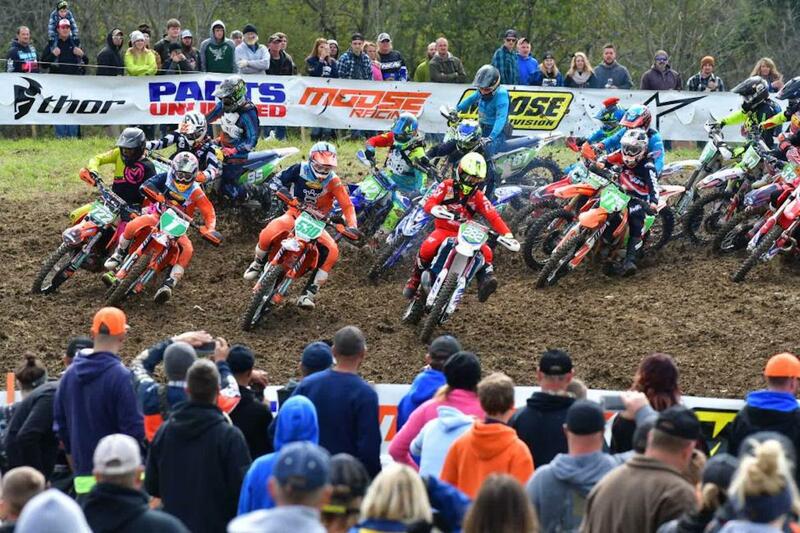 Round twelve of the 2018 AMSOIL Grand National Cross Country (GNCC) Series took place on Sunday, October 14 in St. Clairsville, Ohio. Powerline Park hosted it’s 18th Annual GNCC race, which saw Rockstar Energy/Factory Husqvarna Racing’s, Thad Duvall take the win and FMF/KTM Factory Racing’s Kailub Russell secure his sixth-consecutive GNCC XC1 National Championship. As the green flag flew it was K. Russell getting the jump off the line and earning the $250 All Balls Racing Holeshot Award, however, a mistake at the FMF PowerPoint cost him the lead as he would come around mid-pack on the first lap. After K. Russell’s mistake, Tely Energy Racing/KTM’s Steward Baylor Jr. would take over the lead, followed by KR4/Husqvarna’s Layne Michael in second as they came through timing and scoring after completing lap one. As the XC1 Open Pro class made their way on the second lap, the Powerline mudhole jump would prove to be one of the toughest obstacles of the day. An update from the woods would tell fans and views online that Rockstar Energy/Factory Husqvarna Racing’s Thad Duvall had made his way from third to first during the second lap, with K. Russell making his way from fifth to second. When the top riders came through the finish on lap two, Duvall would lead with Baylor Jr. and K. Russell seconds behind him. The top three were ready to push each other for the penultimate round win. Rockstar Energy/Factory Husqvarna Racing’s Josh Strang was having problems of his own during the second lap, ultimately stopping in his pits for a new rear brake system. Tely Energy Racing/KTM’s Grant Baylor did not get the start he wanted, but he was busy pushing during the first two laps working his way back up to the front of the pack hoping to battle for a podium position. Duvall continued to lead the way at the halfway point, followed by K. Russell both of them stopping for a splash of gas, fresh goggles and hydration. Baylor Jr. would opt out of a pit stop, and made the pass for second in pro row. Baylor Jr. looking to put the pressure on Duvall at the front would not get the chance as the Powerline mudhole became an enemy of his. Baylor Jr. made the jump, but would tip over into the muddy mess, with help from the GNCC “mud fleas” he would get manage to get going again without losing too much time. As the white flag came out it was K. Russell had made the move into first, but Duvall was only 1.46 seconds behind him. G. Baylor managed to move past his brother and teammate on the fourth lap, with Baylor Jr. coming through in fourth as they headed out on their last lap. Beta USA’s Jordan Ashburn made his way to fifth as the white flag came out as he tried to hold on for another top five finish on the season, nevertheless he had a battle cut out for him during that upcoming final lap. When the checkered flag came out waving after six laps, Duvall would come through in the first place position to earn his second-straight win, and fourth overall of the season. 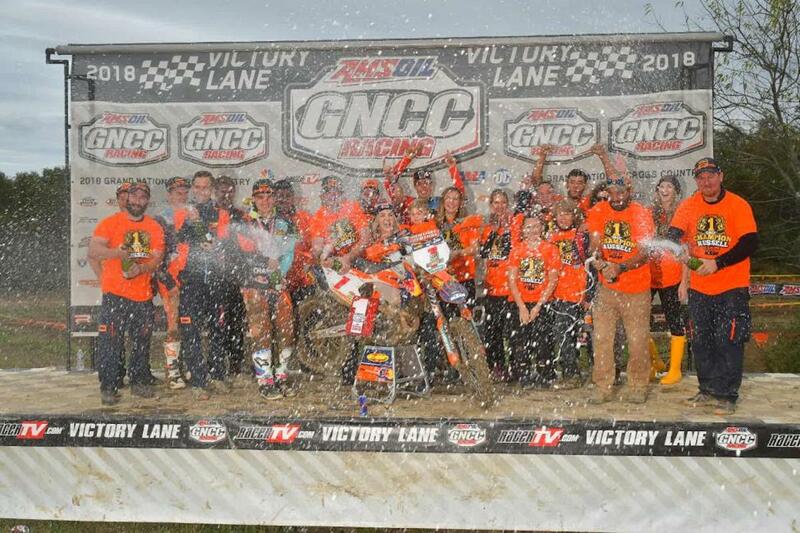 K. Russell would cross the line in second, which was enough points to wrap up his sixth-consecutive GNCC XC1 National Championship one round early. Baylor would hold on to the last podium spot with a third, followed by Baylor Jr. and Strang rounding out the top five in XC1 Open Pro. 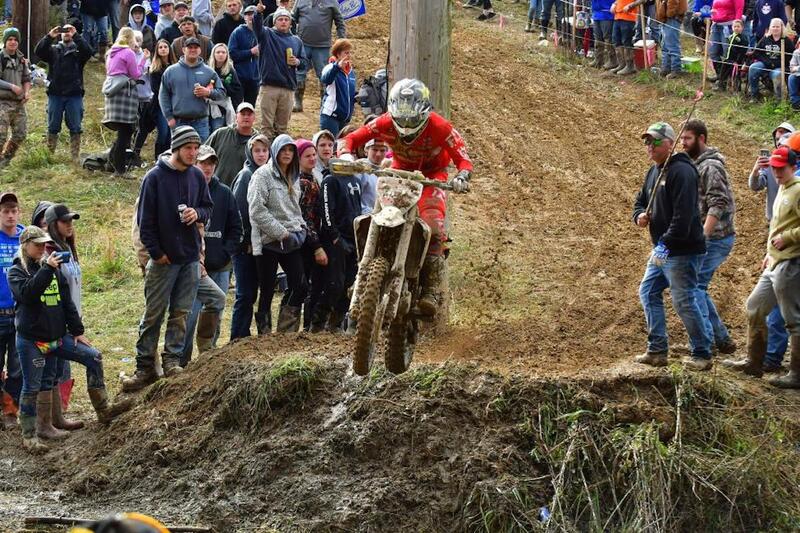 JCR/Honda’s Trevor Bollinger would battle throughout the duration of the race and manage to hold onto a sixth place finish in XC1 and an eighth overall. Ashburn would follow Bollinger with a seventh place finish, while AmPro Yamaha’s Ricky Russell struggled during the day securing an eighth place finish after dropping back to eleventh on the second lap. Michael would also face misfortune after running at the front of the pack early on in the race, ultimately finishing in the ninth place position followed by Factory GasGas/FAR’s Andrew Delong rounding out the top 10 in the XC1 Open Pro class. Solid Performance KTM/ Fly Racing’s Jesse Groemm would complete five laps for an 11th place, while Ohio native KR4/Husqvarna’s Cory Buttrick suffered some bad luck only completing three laps. In the XC2 250 Pro class, Trail Jesters/KTM’s Ben Kelley jumped off the line first grabbing the $100 Hot Cams Holeshot Award. While running at the front of the pack, Kelley would have laptimes fast enough to lead the overall on adjusted time for the first half of the three-hour race. FMF/KTM Factory Racing’s Josh Toth managed to capitalize on lap four as Kelley suffered a crash, and put himself in the number one position in the XC2 250 Pro class. However, after experiencing an issue Kelley would regain the lead and continue to battle wheel-to-wheel for several laps. Kelley would manage to place a gap over the rest of the XC2 field, finishing 54 seconds ahead of Toth, while also joining Duvall and K. Russell on the overall podium in third for the second-straight time. 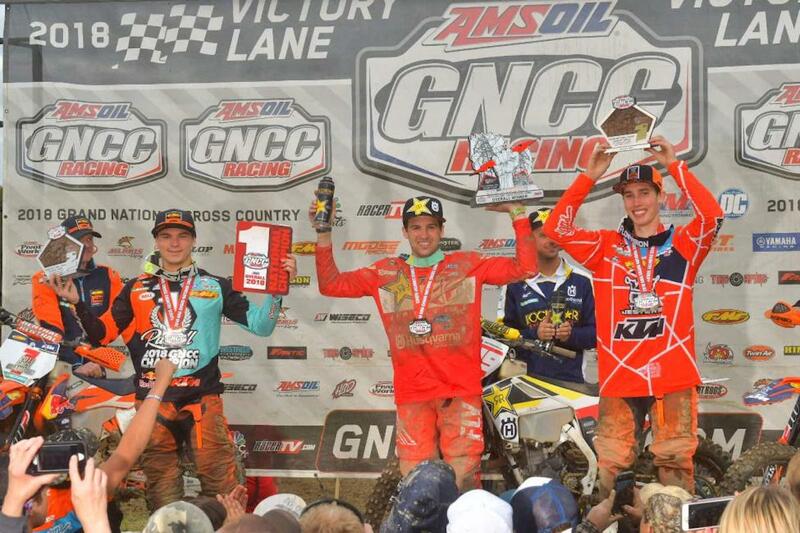 As the GNCC Series heads into its season finale at Ironman in two weeks, Kelley leads by 23 points. Coastal Racing/Husqvarna’s Craig Delong moved himself into third in points, after an impressive ride at Powerline Park. Delong made the pass for third at the halfway point, pushing through to try and battle at the front of the pack. Beta USA’s Mike Witkowski was in podium contention for majority of the race and would hold on for a fourth place finish, which is his best finish of the season thus far. Husqvarna-backed rider, Evan Smith secured another top five finish, making it his third of the season.